The Liquor Store in Gillett Street, Dalston, hosts lots of pop-up events, and for the World Cup period is open daily with large screens, plus a range of interesting beers - Brewdog and more - plus food from Dogtown hotdogs (there seems to be a 'dog' theme going on...) while you watch the games. Freeentry, but £5 guarantees you a place, and gets you your first beer. "The Liquor Store, Dalston right in the Heart of the East End of London. This World Cup Warehouse offers £5 entry guaranteeing you a seat and a beer. The Liquor Store is a Victorian Warehouse converted especially for The World Cup. We have Big Screens & Plasmas throughout the venue, so you won't miss any of the action. 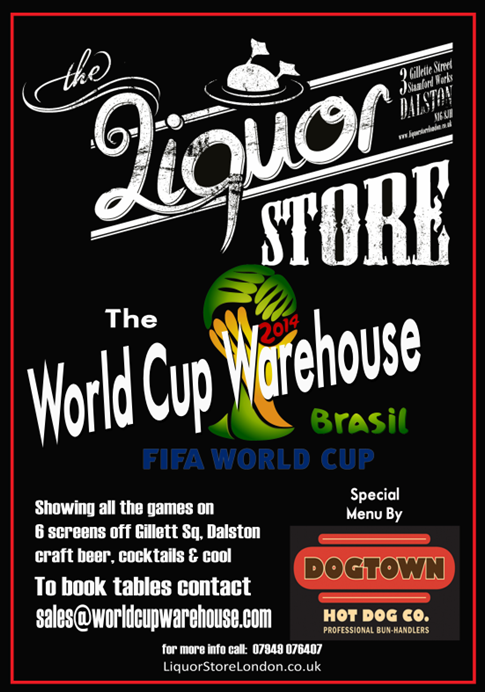 We have DogTown, Brew Dog, Pickleback, INNkeeperUK and Watchingsport as our commercial partners. Join us for any of the 64 games over the next six weeks of football with local & fanatical sports fans from London's great sporting communities." The £5 guarantees you get in, and gets you your first beer.